It’s the second week of #DigPINS and we’re looking at networks. Specifically, the idea of our Public Learning Network (PLN). Despite a robust appetite for talking with strangers and for broadcasting minutiae to social media, the idea of “networking” makes me weary. I imagined networking in the context of late 20th century corporate culture: putting on a power suit, schmoozing, and assessing people in transactional terms. Tonight, I read something that helped me recognize how silly and narrow that idea is. The transformative text came from the introduction to adrienne maree brown’s book Emergent Strategy: Shaping Change, Changing Worlds. In her poetic, free flowing introduction, brown talked about the path and people that led her to learn about “emergent strategy” and to write the book. She named some of the women who were her teachers and mentors and discussed their work. Chief among them Margaret Wheatley, Grace Lee Boggs, and Octavia Butler. It was in brown’s discussion of Wheatley’s work (as introduced to her by Boggs) and the focus on “critical connections instead of critical mass” that spoke to me. In her book Leadership and the New Science, Wheatley introduces ideas of what brown describes as “biomimicry and mushroom magic.” These words sparked in me a vision of bright* mycelium, branching and connecting through dark soil, building a resilient web of slender threads: a network that feeds and nourishes not only the fungal body but also the other species surrounding it. Much of our culture seems to be rooted (pun intended) in a mindset of scarcity and competition. This idea of mycelial growth moves me: networks as born of and generating abundance rather than scarcity. brown describes it succinctly: Relationships are everything. Mycelium by Kirill Ignatyev is licensed under (CC BY-NC 2.0). To bring it back to #DigPINS, I’ve struggled with the question of who makes up my PLN or, in the absence of such a cluster, who would I like to have in it and how I’d reach them? When I consider a PLN as the intellectual (and possibly spiritual) equivalent of mycelial growth that might lead to visible fruit (fungi, y’all! ), I start to get a clearer sense of who and what I’m looking for. Also helpful, this metaphor helps me frame how I might approach people in and around my field in a spirit of abundance and critical connections rather than with the mindset of competition and scarcity. The “declaration” of Bonnie Stewart’s steps for getting started in a network. To go one step further, and take a stab at Joe’s suggestion to write until you know what you’ll write about next: I’m excited to explore the vision of “mushroom magic” as it might pertain to and strengthen the culture of an online classroom. * – Before anyone comments to tell me that mycelium are not bright because they’re underground: it’s a vision, let’s allow for a little poetic license in the telling. letterpress terrarium by kt.ries is licensed under (CC BY-NC 2.0). I appreciate the imagery and the “positive flip” in your thinking. 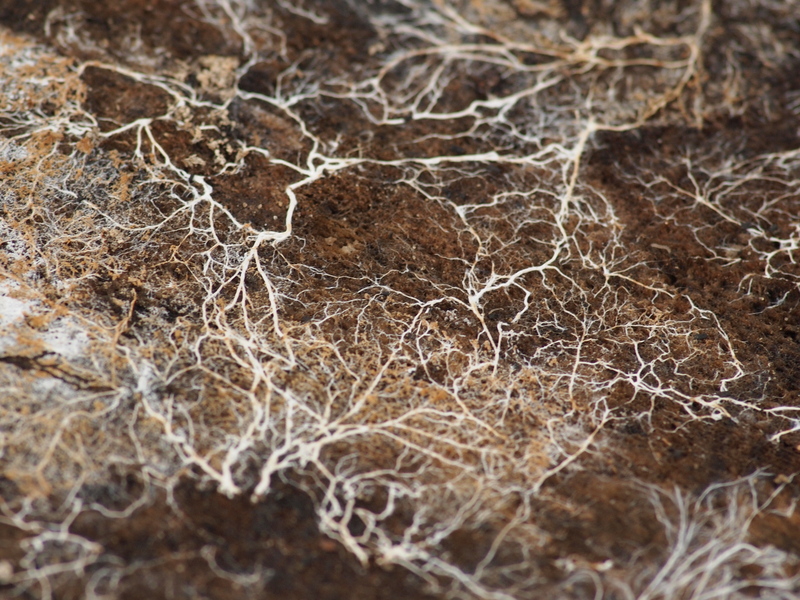 Love this–“These words sparked in me a vision of bright* mycelium, branching and connecting through dark soil, building a resilient web of slender threads: a network that feeds and nourishes not only the fungal body but also the other species surrounding it. Much of our culture seems to be rooted (pun intended) in a mindset of scarcity and competition.” The notion of nurturing surrounding species as well as the “fungal body” is so inspiring and does flip the dominant networking narrative. As a biologist, I appreciate the fungal metaphor. Interesting thoughts here.